This one's mainly for my old school mate Gareth, whose colleague mispronounces lots of things. And this was one of her creations. Actually, a quick Google search brought up this rather good image for Optimist Prime, so it wasn't the first time someone made this connection. But I couldn't resist making this all the same, and I reckon it's different enough in tone. And if I use the same idea again, I'll keep linking to the other Optimist Prime image. 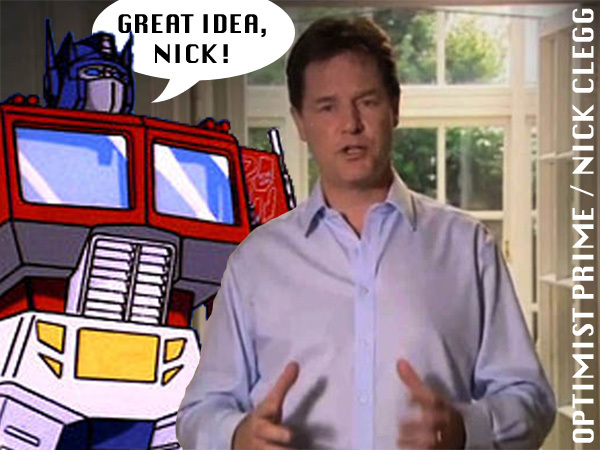 Link of the Day: The Nick Clegg apology parodies, of course.